Well, I know some of you have probably felt that way a few times with your bag of fruit or veggies, so I’m hoping this page will help. If you get something you haven’t seen, don’t know the name of, or how to eat — check this space and hopefully there will be a picture and some info. on it. Most info & pix come from Cook’s Thesaurus. This is an eggfruit (also known as canistel). It is called that because the center of the fruit has the texture of the yolk of a hard-boiled egg. The flavor is sweet like a sweet potato. The fruits should be eaten when slightly softened — they should not be allowed to get mushy or over ripe (can store in the refrigerator to prevent over ripening). Other than eating plain, it is sometimes mixed into a custard with lemon/lime juice, salt/pepper, and mayonaise (??). An “eggfruit nog shake” can be made with the fruit, milk, nutmeg & vanilla. Eggfruits are high in niacin and carotene. So our newest “interesting/strange” item is called custard apple (or cherimoya or sherbet fruit). 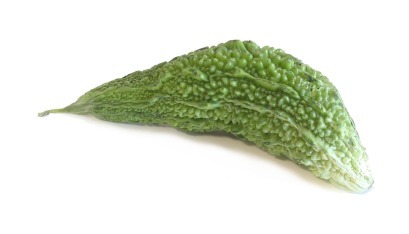 It’s a South American tropical fruit shaped like a pine cone and has a gray-green, scaly skin. This picture isn’t quite a prickly as the one you received in your bag. The soft white pulp inside has large black (inedible) seeds and tastes like a creamy blend of tropical flavors. Hard cherimoyas should be stored at room temperature until they give a little when squeezed, then they should be refrigerated until they’re ready to serve. Do not eat the outside, scoop out the inside. The owner of the market told me that it’s the SWEETEST thing grown on Okinawa. It is sweet and has a sort of gummy texture. One of my boys loved it, the other spit it out — see what you think! Ground Cherries are back in season!! They are my sons favorites! I used to give him one after each house I delivered bags too — that was his reward (he’s a pretty easy kid…). These are also called Cape gooseberry, Chinese lantern, or husk tomatoes. They are a relative of the tomatillo, hence the papery husk. The fruit inside looks a bit like a yellow cherry, and tastes like a sweet tomato. You can eat ground cherries whole, minus the husk, or use them to make very tasty preserves. Kumquats have arrived! They are a winter fruit that look like grape-sized oranges. They can be eaten whole (rind included), but if you have small kids, you may want to cut them in half and remove the seeds. Tanya described them as having “inside out” flavor — sweet on the outside and more tart on the inside. They are a great substitute for Seville Oranges for marmalade. Perfect timing for holiday marmalades! I’ve had persimmon cookies, but had never had the raw fruit before! My kids LOVE them! 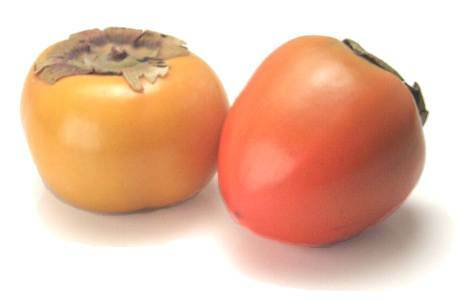 As an interesting background note, there are two varieties: the dark orange, acorn-shaped Hachiya and the light orange, tomato-shaped Fuyu (which are the ones we have in Japan). The Hachiya must become soft & ripened to eat. Fuyus aren’t as flavorful, but they’re more idiot-proof in that you can eat them while they’re still firm and not get your mouth in a pucker. My mamasan told me to peel the fruit first, but I don’t think this is necessary. Starfruit season has arrived!! 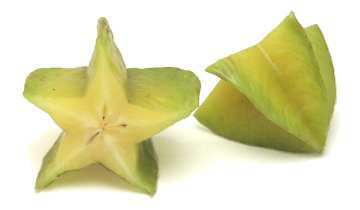 Star fruit have a clean, crisp texture, and they make terrific star-shaped garnishes when sliced. They’re also easy to use, since they don’t need to be peeled or seeded, and they’re slow to discolor. Some varieties are sweet, some are sour. Try to avoid ones that have brown spots or streaks. 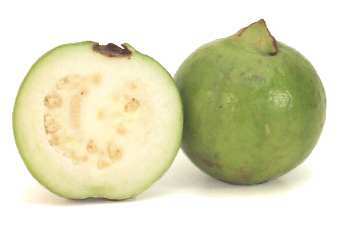 Guava: These bruise easily, so markets usually sell them while they’re still hard and green. Allow them to ripen at room temperature until they become yellow and very aromatic, then either eat or refrigerate them. Don’t peel them, just remove the seeds. Pix from Wikipedia. If you’ve ever taken a Vitamin C supplement before you’ve probably had acerola! It is one of the greatest natural sources of Vitamin C that exists — it can have up to 6x as much as an orange. Check out THISblog for more info. These are wing beans! They are beautiful and look like “X’s” when cut. 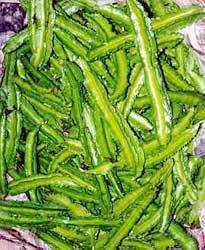 The taste is similar to green beans, so substitute them for an exotic touch to a recipe. Believe it or not, this very “pale zucchini” looking veg is called a sponge loofah because when it is ripe, it can be turned into the kinds of loofah’s you use in the bath (as pictured here)! 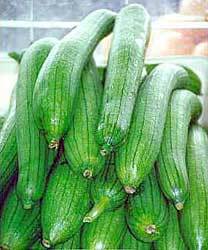 But in it’s early stage, can be eaten as a vegetable — much like zucchini. Took me two days to figure out what this is. In Japanese it is “renbu” but evidently in English it’s a wax apple. The fruit is juicy and crunchy with a light, sweet, and tart flavor. Its texture can be compared to an apple’s. When choosing a good wax apple, look for ones with the bottom segments closed up because open holes signify worm eggs inside the fruit. Also, usually the reddest fruits are the sweetest. To eat, the core is removed and the fruit is served uncut, in order to preserve the unique bell shape presentation. 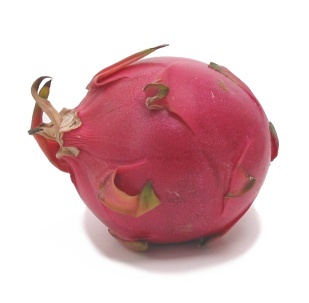 So this is Dragonfruit. Originates from Central/South America. The flesh is sweet and refreshing with a slightly acidic melon-like flavour. Best eaten ripe – it should give a little when gently squeezed. The fruit can be stored in the refrigerator for up to three days. Best eaten chilled and sprinkled with lemon or lime juice to enhance the flavour. Cut in half lengthways then scoop out flesh. 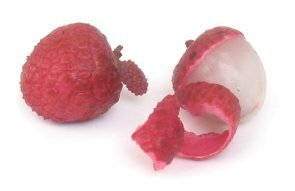 And this is lychee a Chinese fruit about the size of a walnut, with a bumpy red shell encasing white translucent pulp that’s similar in texture to a grape. The flavor is sweet, exotic, and very juicy. Don’t eat the shell or the seed. Fresh lychees are available from May to July. 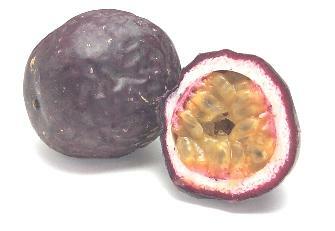 Passionfruit is an aromatic fruit that has a tart, tropical flavor. They’re ripe when their skins are wrinkled. The seeds are small and edible, so leave them in if you like. Japanese Radish: The Japanese like to grate it and serve it with sushi or sashimi, but you can also pickle it, stir-fry it, or slice it into salads. Japanese daikons tend to be longer and skinnier than their Chinese counterparts, but the two varieties can be used interchangeably. Choose specimens that are firm and shiny. They don’t store well, so try to use them right away. Japanese Yam – white on the inside. Okinawan purple potato or yam. 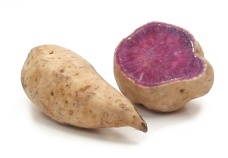 The flesh of this Japanese sweet potato is vivid purple. It’s perfect for tempura, but it can also be baked, sauteed, boiled, steamed, or mashed. Dragon Tongue beans: You can eat these, pods and all, just like green beans. Okra: When cooked, okra exudes a slimy substance, which serves as a wonderful thickener in stews. Unfortunately, that sliminess puts off many diners, but you can minimize it by buying small, fresh okra and by cooking it very briefly. Okra’s popular in the South, where they fry it in cornmeal, pickle it (this also gets rid of the sliminess), and use it to thicken their gumbos. 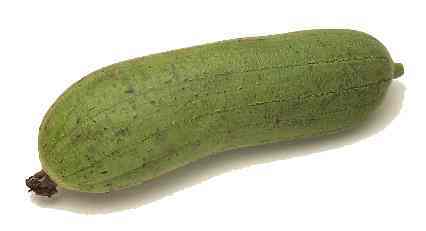 Chinese Okra: There can either have a smooth surface or one with deep ridges. 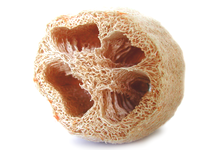 The ridged version is sometimes called angled loofah. 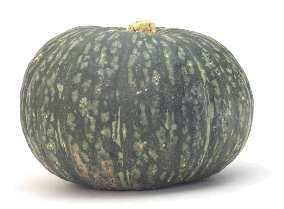 Kabocha: This orange-fleshed winter squash has a striated green rind. It’s sweeter, drier, and less fibrous than other winter squash, and it tastes a bit like sweet potatoes. Hi, I was searching your website to see if I could send your bag of fresh vegetables and flowers to my friend who works in Okinawa for her upcoming birthday….and that I could pay via paypal or whatever as I am in Singapore. Do you have such service? I also would like to send your service as a gift to my step-daughter who has just arrived on the Island. Please advise if this can be done and if so – How. Hi, I ordered a tropioki and I think it contained sugarcane. Any ideas? I am having touble finding much on google. We didn’t do anything very exciting: Peeled off the outer layer and chewed on it till all the sweetness was gone. Hope someone else did something more interesting with it!! Hi Robin, the content of the bags are dependent on what the farmer’s bring to the market. Unfortunately Melody does not know ahead of time what will be there (other than knowing it will be similar to the week before — as far as seasonality). What is the orange colored vegetable, shape and size of a tomato? This was in the bag for the week of 9/24. Thanks. The persimmons are so yummy!! The variety in the bag this week is Fuyu, and the best way to eat it is just like it is. Whole or cut up, peeled or not…….anyway you eat it, it’s yummy and nutritious! I forgot to add, I think it tastes like a combination between a peach and a plum. have you come across any locally produced honey? I have seen some at the market in Onna. It’s very expensive — I think $18 or so for a jar. Haven’t tried it either. But let us know if you discover anything! Actually there is a place just south of the Onna Market on 58 that sells local honey, I dont remember exactly but definatly between the 2 RT 6 lights. Enjoy! Where is the Onna Market in 58? Jennifer, it’s on the right side of the 58 in Onna. Just past the Renaissance Hotel. In Reference To sugar cane and what to do with it, you can boil it down and make raw or “brown” sugar. Then make home made ice cream, using that sugar. Okinawans make brown sugar ice cream (Try Blue Seal) and it’s delicious. Do you know where I can get food-grade cinnamon oil? Mangos are almost back!!! Oh the sweet lovely Okinawa mangoes… I wish i could come back just for mango season! Can they be shipped to the states? I would like to place an order, depending on how much it would be…. Hope all is going well for all out on Oki!